Mixology Monday has had a good run at life. The event first started with Paul Clarke back in April 2006, and he ran it until MxMo 64 in February 2012. My participation started at MxMo 30 in August 2008 after having read along as a spectator for a year or so. As Paul was losing steam, I begged to take over the event instead of letting him bury it. Luckily, he turned over the reins to me, and I led the march from MxMo 65 in September 2012 until this one for a total of 52 events. When I was looking back at the history, I found a thread on the Chanticleer Society where someone was asking about Paul Clarke in the hiatus between February and September 2012; prophetically, I commented in that thread, "Perhaps I am blinded by my own enthusiasm -- I've been contributing to MxMo for 4 years now and would gladly do another 4 years." In the last year or two, my wife often heard me gripe about how hard it was to get hosts as well as a decent number of participants. The last few despite having amazing replies in quality to the theme were shy of the double digits mark or not much above that in quantity. The final moment that set this death knell a-ringing was when the Mixology Monday website locked me out of logging in right before I was about to enter the wrap up post for MxMo 114, and Paul Clarke did not know how to get me FTP access to see if I could remedy this situation. So that prophecy for another 4 years was correct with another 6 months added on. So it is time for the final theme, the Irish wake. The Irish wake is a funeral tradition that is a send-off that begins at the time of death until the body is handed over to the church. It is viewed as a crucial part of the grieving process. My first Irish wake was a little over a year ago when Boston barman Ryan McGrale met his untimely demise. While the wake part with the family was sober, the mourning process with the Boston bartenders and the New York City ones who traveled up was most certainly not. Irish whiskey flowed. I remember getting home and wondering why my key would not work and I considered sleeping in the garage. Turns out, it was the wrong key on my key ring and it took awhile to figure that out. So what better way to celebrate the life and times of Mixology Monday and its 11 year run as the premiere "monthly online cocktail party" than with Irish whiskey. For this theme, the approach is two fold. You can go traditional and generate or uncover a cocktail recipe calling for Irish whiskey. Alternatively, you can talk about a personal moment either where Irish whiskey played a role in life or where drinks in general helped the grieving process. Such stories were actually rather cool for MxMo 41 "Vodka is Your Friend," so there is precedent for that, but it's not like we can break Mixology Monday for future events by straying from the rules. • Find or concoct a recipe that calls for Irish whiskey. Or share a drinking story about Irish whiskey or the grieving process. • Make the drink and then post the recipe, a photo, and your thoughts about the libation on your blog, tumblr, or website or on the eGullet Spirits and Cocktails forum. If it is the story format option, feel free to post a photo or two to make an emotional connection. • Include in your post the classic MxMo logo or the special Irish wake one above, and a link back to both the Mixology Monday and Cocktail Virgin sites. Actually, you don't need to link back to the deceased MxMo site if you do not want to. And once the round-up is posted, a link to that summary post would be appreciated. The due date is Monday night at midnight, February 20th. Let's try posting this in the right place. :-p Did we mention the second one is a bit strong? ;) http://wp.me/p2Kswh-dBT Thanks again for keeping the flame burning through all these years. 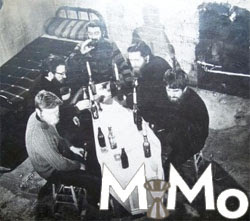 MxMo has been a great part of our own booze blog journey. We shall miss it and also understand the need to let it go. Cheers! I've almost forgotten the entire protocol! "Don't wake me while I'm sleeping"
Thanks for hosting this final mxmo! With heavy heart, here is my submission. Thanks again for keeping it going for as long as you did. Cheers! Once more into the breach my friend. I was there at the beginning. I'm here at the end. A heavy heart, yes, but a good (hard) choice still. A toast to you, dear Fred, and everyone who participated! Cinnamon toast, natch. Cheers to you and Paul, Fred. Were I to have a blog untainted and co-opted by ecigarettes, I would gladly have given this a final whirl. I met fabulous people and made amazing memories through this hobby and community so thanks again for being a part of that and keeping MxMo and the community going; it's wonderful. Since it is Tiki month at the Pegu Blog, the URL link was probably traveling over to Boston in a message in a bottle. I'm a craft bartender in Smallish-town, USA. We have a large university here that is on the verge of idiological collapse, and our food scene still leaves much to be desired in its current state of "up-and-coming". But we eek onward because we love what we do and we love (most of) our clientele. This town would attract more savvy diners if the local infrastructure would take itself more seriously instead of catering only to the college students. And it's looking more and more like that change is about to happen. But isn't it always "about to happen"? I feel like there's been a massive change of tide in the blogosphere surrounding gourmet food and craft cocktails. While the people buying out the web-zines were trying to better capitalize on what it was we were all going on about, they completely lost site of what it was we were interested in reading. The zines became more about the sales-pitch than the enthusiasm of GREAT FOOD and DRINK. And the more that happened, the more people maybe stopped paying attention. (#TastingTable, I'm talking a lot about you.) Even the ads became less about innovation and more about reiterating existing kitchen kitsch. So that MxMo is coming to an end is less surprising than simply perplexing: where did it all go awry? It's sad when corrupt politics gets more of a platform at the dinner table than the food and drink itself. When will it end? 1) Blogging was crucial when there was less written about cocktails and fewer cocktail meccas. It was the best way to catch people up to speed by discussing ingredients, techniques, books, etc. Now, there are plenty of resources out there. 2) A lot of the basics have already been covered. Reading another treatise on the Vieux Carré is not as exciting now as it was in 2006. 3) Instagram and Reddit /cocktails took a lot of the new faces and some of the old. More immediacy in Instagram without spending all the time writing about things. It became about photo composition. 4) People who blogged moved on to bartend, write professionally, or give up the trade. With MxMo, I was getting 30-40 participants when I took it over and people were queued up to host. Towards the end it was 6-8 and I was begging people (or hosting it myself again or skipping months) to host. Oh well. There was only so much that I could do.